Warning! This Workbook Creates Change! I want to share something with you…I have discovered a soulful, women’s workbook that is life changing! I really love this book and wondered if you might too. So, the new year has started. And somehow we’re already into February. How is your year going so far? Do you know what you want from 2017? What would you like to give, receive, feel, create, transform this year? I’ve been thinking about this a LOT. For the past month, I’ve been enthusiastically filling out my fabulous ‘2017 My Shining Year’ workbook, by a gorgeous Australian woman, Leonie Dawson. It. Is. Awesome. Leonie Dawson is this amazing, creative, energetic, quirky, soul-centred, women’s life coach kinda person. 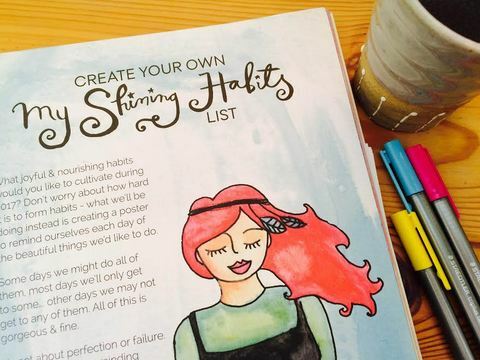 She has created a workbook that is designed for women to get clear on what it is that makes their hearts sing and then, using practical goal-setting strategies, make cool stuff happen! The book focuses on areas of life such as creativity, soul, mind, relationships, family, body, home, travel, adventures, finances, community, self-care and support. The act of considering what you truly want in each area of your life and then writing those dreams down, is a powerful and intoxicating experience. Each section asks specific questions, so that you can become as clear as possible about what you want and the steps you need to take to make it happen. To look inside the ‘2017 My Shining Year’ workbook, click here. Since using this workbook, I have been much more mindful of how I live my life, of what is important to me and of the power of getting clear on my intentions. Did I mention how colourful, playful, creative and fun this workbook is? So much so, that every time my daughter, nieces or friend’s children come in contact with my book, they are drawn to it. My daughter has even been doing her own version of some of the exercises. A number of my friends and family also have this book and we get together to discuss what we want to create in our lives and how we can achieve our goals. According to Leonie, 80% of people don’t really even think about goals; 16% think about them, but don’t write them down; 4% write them down; and only 1% of people write down their goals and regularly review them. That 1% of people are apparently the highest achievers. To me, it makes sense really, and I’d like to be a part of that! I don’t know about you, but for me, the idea of goal-setting has always sounded so dry and like a lot of hard work, but this workbook makes it feel inspiring and fun. According to the workbook, the results that can be expected from doing all of the exercises are: more dreams and goals achieved; increased self-confidence; deeper, more fulfilling relationships; purpose, direction and motivation; improved productivity; a wild surge of joyful creativity; your bucket list being ticked off; sky-high levels of joy, love, calm and fulfillment. Obviously you have to actually complete the workbook and regularly review your goals and actively work toward making your goals happen, but if anything is going to help with that, this book will. I most love the areas of the book that focus on self-care and nurturing, as well as the parts that encourage you to dream BIG and really get specific about how your life could look if you dared to follow your heart. Since starting the ‘2017 My Shining Year’ workbook, I have booked a big adventure that wasn’t even on the cards at the start of the year; I’ve deepened my connections with others; I’m much more purposeful and productive; I’ve already started ticking off things on my “100 things to do in 2017” list; and I feel infinitely more inspired. That’s a pretty good start to the year! 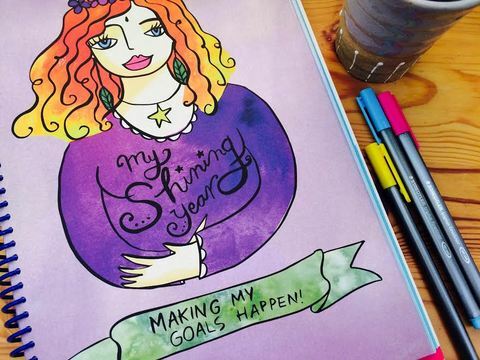 To find out more information about ‘My Shining Year’ workbooks, go here! If you are part of a Not-For-Profit organisation that works with women, Leonie is donating workbooks for free! Here is the info on that. A bit about me: I am a psychotherapist and counsellor in Perth, Fremantle and Mundaring, Western Australia. I specialise in working with women around the issues of self-worth, anxiety, body image and personal power. I am a certified Gestalt Therapist, with a BA Psychology and a Grad. Dip. Women’s Studies. I have a strong interest in trauma therapy and use both body awareness and art therapy in my work. How exciting! I’d love to hear how you go with it.